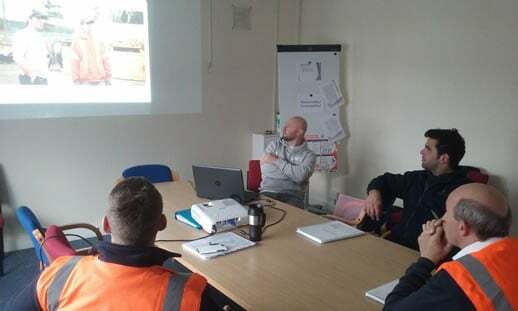 Thom Baxter, Ferryspeed’s Health and Safety Advisor, ran the IOSH (Institution of Occupational Safety and Health) Safety Management course for six supervisors from the Jersey depot and four from Guernsey. IOSH is one of the largest health and safety membership organisation in the world as well as being a chartered body. The recently-completed course, which is the latest training provided by the Ferryspeed Academy, is now a pre-requisite for Ferryspeed’s supervisors. Once the training is complete, they can be called Safety Supervisors. Safety Supervisors take greater health and safety responsibility for their departments and conduct weekly checks in order to remain compliant with Ferryspeed’s policies. In addition, they will be able to run inter-departmental training sessions, toolbox talks – a short presentation to colleagues on a health and safety issue, and assist the company with an ongoing review of risk assessments and method statements. Myles Le Basse Fitton, Group Compliance Manager at Ferryspeed said that the training provided to the supervisors is top of the tree. “An IOSH qualification is well-respected and not only provides our supervisors with greater credibility, but fits in with our academy concept of providing training in-house. As a company we need to stay ahead when it comes to health and safety by providing our employees with the best possible training. We have a target of zero injuries and incidents, and the recent IOSH course plays a pivotal part in making this possible,” added Myles. A further 10 supervisors from the Jersey and Guernsey depots will take part in the IOSH Safety Management training later this year.